With prices for crazy paving stone for as little as $36m2, its a steal! Stone & Slate Discounts have on display and in stock Melbourne’s largest range of crazy pave. Sandstone Crazy Paving – Light golden hues leading into more rustic burnt sienna shades. Great for using as driveway paving or pool pavers, whilst also looking great as stone cladding on a feature wall. Price varies from $33m2 upto $49m2 including gst. Slate Crazy Paving – Because our range is so extensive, we have slate paving in yellow hues, grey hues with slight golden tones, gunmetal bluey greys with burnt sienna rustic infusions to traditional grey/black. Great for use as driveway pavers, pathway paving and outdoor pavers. Price varies from $33m2 thru to $56m2 including gst. 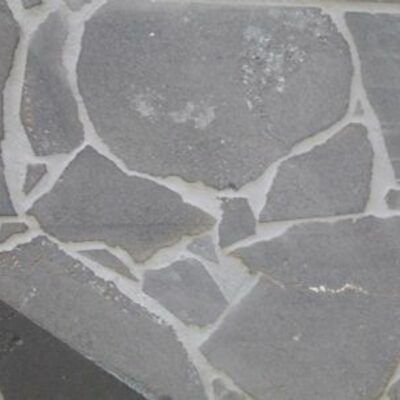 Bluestone Crazy Paving– Traditionally in Melbourne bluestone paving has been composed of off cut material from production of the pavers ( when the bluestone boulders are sliced then cut into pavers). This bluestone paving off cut material will of course have a high percentage of straight edges, BUT when installed by an expert stonemason it can look extremely good. For the past 5 years we have been able to offer the bluestone boulder slices as crazy pavers for our discerning clients. The look of this can be described in one word “WOW.” Bluestone crazy paving off cut material is quiet reasonably priced from $33m2 (20mm thick) $36m2 (30mm thick) $40m2 (40mm thick). Whilst Bluestone paving in boulder slices is priced from $59m2 (20mm) thru to $69m2 (30mm) including gst. Pieces vary in size from 400mm diameter up to 900mm diameter. Limestone Crazy Paving– Colour tones vary from Black thru to Yellow. Limestone is well suited to usage as driveway pavers, pool pavers, and stone wall cladding. It is priced from $36m2 thru to $59m2 including gst. Quartzite Crazy Paving– Colour tones vary from Black thru to Yellows and Ochres. Quartzite is EXTREMELY hard and dense, it is well suited to usage as driveway pavers, pool pavers, and stone wall cladding. It is priced from $39m2 thru to $69m2 including gst.